Should E-Sports be Considered a Sport? Leah Jackson mentioned in “The Rise of ESports in America” that over the years, electronic sports, also known as E-sports, have progressed significantly. Millions of people both watch and play E-sports. Games like Dota 2, League of Legends, and StarCraft are popular in the E-sports community and are played professionally. The definition of a sport is “a contest or game in which people do certain physical activities according to a specific set of rules and compete against each other” (“Sport”). Since E-sports do not require the amount of physical activity regular sports do, people may fall under the impression that gaming is not a “real sport.” Regardless of the lack of physical activity, gaming requires the same amount of effort and dedication as regular sports do. E-sports are also just as popular in society as regular sports are. The definition of “sports” should be modified so that gaming would be more accepted as a sport by society rather than just a game. Despite their differences, E-sports should be viewed as an actual sport. Poker, a famous card game, is considered a sport even though it requires very little physical activity. Poker is considered a popular enough sport to be broadcasted on ESPN, a TV network that broadcasts the most famous sports. Despite the lack of physical activity, Poker is considered a sport because it targets the one thing majority of the population cares for: money. In his article, “Does Poker Qualify as a Sport?” Jay Lovinger states that people love that thrill of seeing others either win a big sum of money or lose their life savings. People mainly watched poker because they just want to know the outcome of the bets they placed their money on. Poker is only considered a sport because it is popular in society and people enjoy playing it. Since poker is considered a sport because of its popularity, E-sports should definitely be considered a sport. The genres of games that are mainly played in E-sports are RTS (real time strategy), FPS (first person shooters), and MOBA (multiplayer online battle arena). League of Legends is a MOBA game that has 27 million players that play daily and 67 million monthly. (Tassi). The game’s popularity has led there to be tournaments held worldwide to determine the best players. Just like how basketball has the NBA to decide which team is the best, League of Legends has the League of Legends Championships (LCS). The 2014 LCS world’s tournament held a 2 million dollar prize pool. The first place winner took home $1 million, second place took $250,000, third and fourth took $150,000 (Warr). The large amount of money given in rewards show how widely supported the game is. Though E-sports may not be considered a sport by definition, it is treated as a sport by all of those who support the LCS. Games such as League of Legends are not easy to play and take time and effort to learn. The purpose of this game is to destroy the enemy’s Nexus, their power source. There are five players on each team, all of which are distributed to three different lanes: the top lane, middle lane and bottom lane. The three lanes on the map include jungles on both sides. The player in charge of the jungle helps out others in all the lanes. Before the game starts, the summoner, the person playing the game needs to choose a champion to play with. Champions are powerful in their own unique way and it is up to the summoner to choose which one would benefit their team best. The game then starts off with three turrets to destroy before reaching an enemy inhibitor. Turrets are towers that will attack a champion if no minions are around. The minions are created from the team’s nexus. Their job is to destroy the enemy towers, inhibitors, Nexus and assist killing members of the opposing team. After the lane turrets, the team attacks the inhibitors. An inhibitor is a structure that prevents super minions from spawning. Once the inhibitors are destroyed, the team targets a pair of turrets that protect the Nexus. When the players destroy the turrets, the nexus becomes open for attack and the game is won after its destruction. Sports should not be all about physical activity. Some of the most famous sports are played as a team: baseball and soccer. Even though both of these sports require physical activity, they also depend on strategy and team work. A person can easily run around kicking or throwing a ball to demonstrate physical activity. However, to play a sport means to have a strategy while kicking and throwing the ball. Communication is required with others to know where to throw and kick the ball. League of Legends and other E-sport games entail an abundance of communication and teamwork. While playing a game on a computer, the level of communication increases because teammates may not be in the same venue. Sport is a field of cultural activity, in which human beings voluntarily establish a relationship with other people, consciously intending to develop their abilities and accomplishments in particular in the area of skilled motion — in order to compare themselves with other people, according to rules set by themselves or adopted on socially accepted ethical values (qtd. in Powell). This should be the revised definition of “sports” because most sports today have all of these qualities. Even if a person is playing a sport by himself or herself such as tennis or golf, they still have to communication with their competitor. They still consciously intend to develop their abilities by recognizing their weaknesses and strengths while seeing others play. Those in agreement with the president of ESPN, John Skipper, may not agree with E-sports being considered a sport. Skipper said that “It’s not a sport — it’s a competition. Chess is a competition. Checkers is a competition…Mostly, I’m interested in doing real sports,” (qtd. in Tassi). Many would agree with this statement because most are under the impression of sports having to do with physical activity. This is because most sports that are covered by the media require physical activity, and over time it was culturally accepted that sports would have to have a physical feature. Gaming can be physically intense even though many view it as not, it has everything in common with what is seen as an actual sport. Gaming requires an enormous amount of coordination and concentration to click while pressing buttons on the mouse and keyboard. Powell mentioned that StarCraft players in Korea wrote a documentary called “The Hax Life” that stated that each pro player must be able to do hundreds of actions per minutes (APM). A hundred APM is how fast a gamer’s movement should be on average. However, if he or she wanted to win a championship, they would need to be around three hundred APM. To be able to play with three hundred APM, gamers need to train for long periods of time. Just because E-sports are played while sitting down, people believe that they lack skill. Those who have never experienced gaming overlook how difficult it is to have over one hundred APM. Not everyone is capable of having three hundred APM, thus proving that gaming does require skill and is not for everyone. In summation, the definition of sports should be modified so that E-sports would be accepted as a real sport. Physical activity isn’t the only thing that makes up a sport. E-sports have the same qualities as regular sports. Though they don’t require a large amount of physical activity, E-sports are difficult to play because they require concentration and strategy skills. 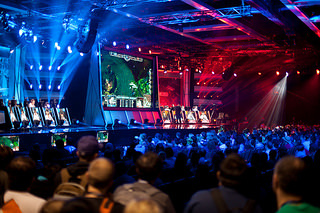 The popularity of E-sports is displayed through the League of Legends Championships where there are million dollar prize pools. E-sports require more communication than any other sport because there is no physical contact with the team. If E-sports were accepted as a real sport, more people would want to try it out and play, growing its community. Gamers would be recognized and given more credit for their talent during tournaments. Gaudiosi, John. “Pro Gamer George ‘HotshotGG’ Georgallidis Explains Why Koreans Will Dominate In League Of Legends.” Forbes. Forbes Magazine, 04 July 2012. Web. 06 Nov. 2014. Jackson, Leah. “The Rise of ESports in America.” IGN. Imagine Games Network, 25 July 2013. Web. 05 Nov. 2014. Lovinger, Jay. “ESPN.com: Page 2 : Does Poker Qualify as a Sport?” ESPN.com: Page 2 : Does Poker Qualify as a Sport? ESPN, n.d. Web. 13 Nov. 2014. Powell, Jacob. “eSports scores professional status.” Al Jazeera (Qatar), 30 July 2014: MainFile. Web. 3 Nov. 2014. “Sport.” Merriam-Webster.com. Merriam-Webster, n.d. Web. 13 Nov. 2014. <http://www.merriam-webster.com/dictionary/sport&gt;. Tassi, Paul. “Riot’s ‘League of Legends’ Reveals Astonishing 27 Million Daily Players, 67 Million Monthly.” Forbes. Forbes Magazine, 27 Jan. 2014. Web. 05 Nov. 2014. Warr, Philippa. “Why the $2m League of Legends Prize Still Matters.” ESPORTS. Redbull, 11 Aug. 2014. Web. 06 Nov. 2014. Submitted for ENG 101 Composition, Fall 2014. Assignment: Research Argument. Instructor comment: I really enjoyed the writer’s willingness to put counterargument front and center throughout. Jerry attacks the notion of what a sport should be head-on and does not shy away from it. He does a great job combating the standard definition of sports through attention to detail and diverse research. Photo credit: “League of Legends Tournament” by Camknows. Licensed through Creative Commons.